I planted the salvia last weekend and by today, it was starting to bloom. And a bee showed up to extract pollen. Just one, although it was enough to entertain the dog for quite a while, the same as last year. I don’t want to have bee hives in my yard due to the close proximity of neighbors. 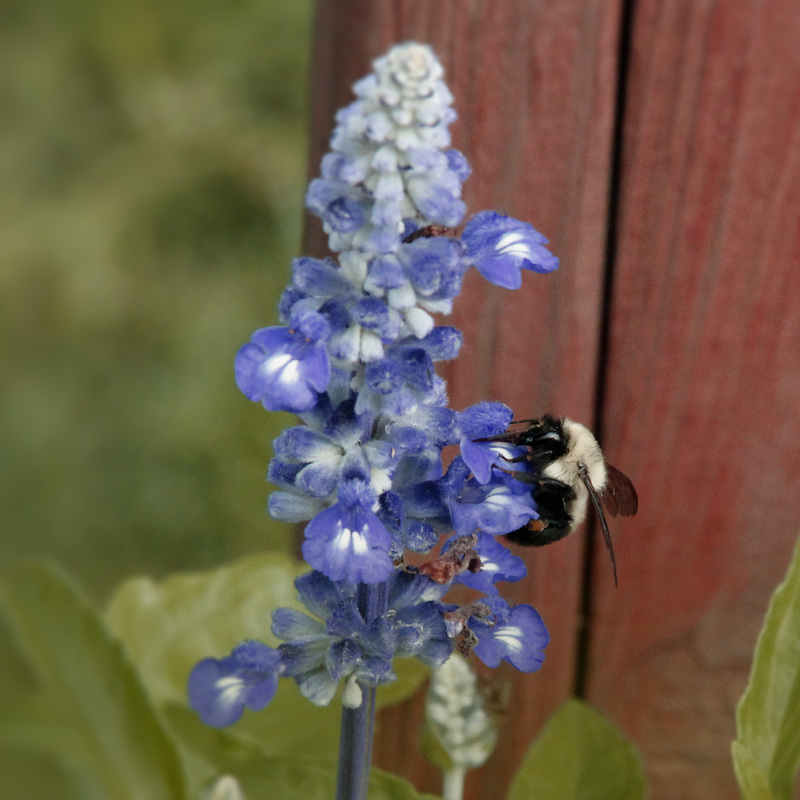 But I can encourage the bees to come by providing flowers that they like and the salvia is one of them. I need to get them used to coming back – the squash seeds have already sprouted and in the next few weeks, there may very well be flowers that need pollinating. Last year’s plants grew nearly 25 butternut squash for the favorite boy toy and I to enjoy. So here’s to nature’s magicians in pollen – from the extract to smearing it all over and rubbing it around on those plants that need it to make vegetables. Word for tomorrow – ALPHA. If you prefer to work ahead, see the list for the week under “A Word A Day”. Salvias. One of my most favorite. I used to collect any kind I could find when I lived down south. Believe it or not, i’ve been able to find some that do quite well here in the cold midwest also. This…makes me happy. Depot Garden Center a few years back, when I was having so much trouble getting my squash pollinated. I’ve planted several every year since and have had a good crop of squash ever since. They really are pretty aren’t they?